They Talk About Death, a chapbook by Alessandra Bava, pays subtle, elegant homage to the masters of misery. 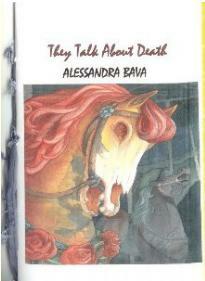 In the title poem, "They Talk About Death," Bava eloquently states ". . . you can almost/hear//them talk of the Pale/Rider as if they were/chatting about an old/acquaintance." Bava is, of course, referring to the influential Death writers and artists she tributes in this chapbook such as Sexton, Plath, Rimbaud, and Modigliani. At the same time, Bava's words could be describing her own chapbook, as that is exactly how she is talking about these authors-as if they were her dearest friends. This series of poems welcomes us into the author's parlor, pours us a cup of tea, and invites us into an inner circle of ghostly gossip. We walk "into the hazy streets of Montparnasse" with Modigliani and his wife in "Never Thirty Seven," as they contemplate the joys of pre-death: their blossoming pregnancy, the potential of a son. In "Our Lady of Napalm," we grapple next to Sexton as she attempts to transfix her demons onto the poetic page: "Imprisoned and tortured you type/on your bed of stone, as a/St. Barbara of Poetry." Bava opens every vein she can find for us. Nothing is off limits here, not even Plath's suicide note. Bava hauntingly echoes Plath's desire to leave ". . . in the arms/of February, winds --" in the poem "Milk and Bread." And we as readers feel we are dangling in that cold wind, as page after page we are confronted with intimate portraits of death and despair. The ending of "Our Lady of Napalm" whispers Bava's vivid mantra: "Suicidal Light demands worship." This idea reverberates throughout the pages of this poetic church. We read and worship as one, closing the pages with remorse and relief, as well as a revitalization of spirit that can only come from hanging on to the precipice of death, then crawling back onto solid ground.